Researchers block mitochondrial glucose production to treat type 2 diabetes in preclinical trials. High blood sugar is a defining characteristic of Type 2 diabetes and the cause of many of the condition’s complications, including kidney failure, heart disease, and blindness. Most diabetes medications aim to maintain normal blood sugar (glucose) levels and prevent high blood sugar by controlling insulin. Now, a study from researchers at University of Iowa shows that another biological checkpoint, known as the Mitochondrial Pyruvate Carrier (MPC), is critical for controlling glucose production in the liver and could potentially be a new target for drugs to treat diabetes. The team states that their findings show that disabling the MPC reduces blood sugar levels in mouse models of Type 2 diabetes. The opensource study is published in the journal Cell Metabolism. Previous studies show that glucose is primarily made in the liver and requires the molecular building blocks to pass through specialized cellular compartments called mitochondria. Mitochondria use a small molecule called pyruvate as the starting point for synthesizing glucose, and the pyruvate is imported into the mitochondria through the MPC portal. Earlier studies by the lab and other institutions have identified the genes encoding for MPC. In the current study the researchers used this genetic information to specifically disrupt MPC activity in animal models. Data findings show that disrupting MPC in normal mice doesn’t cause low blood sugar, or hypoglycemia, which would be important for the safety of any new treatment targeting MPC. The group observed that in mouse models of Type 2 diabetes loss of the MPC activity in the liver decreases high blood sugar and improves glucose tolerance. Results also suggest that MPC activity contributes to excess glucose production and high blood sugar levels in Type 2 diabetes. The researchers explain that the therapeutic potential of targeting glucose production in the liver is supported by the fact that metformin, the most widely used and staple treatment for Type 2 diabetes, also decreases glucose synthesis in the liver by disrupting mitochondrial metabolism, although the exact mechanisms underlying this drug’s action on mitochondria are controversial. The current study showed that disabling the MPC in mouse livers shuts down this major route of glucose production. However, because glucose is a critical cellular fuel, the lab state that there are ‘back-up’ mechanisms. Results show that when the MPC was disabled in mouse livers, another glucose-producing mechanism was activated to compensate; this alternative mechanism uses molecules from protein as the building blocks for glucose. Data findings show that disruption of the MPC makes the liver less efficient at making glucose and, as a result, the liver burns more fat for energy, makes less cholesterol, and makes less glucose in models of diabetes. The team conclude that this overall change in metabolism matches outcomes that would be therapeutically desirable for people with diabetes. The researchers surmise that additional research will be required to determine if inhibiting MPC activity might be a safe approach for human therapies, especially in people under high levels of physical stress or with other medical complications. For the future the lab plans to extend their studies to cultured human liver cells to determine if disabling the MPC produces the same metabolic effects as seen in the mouse studies, and to make sure that inhibiting this checkpoint does not produce dangerous side effects. Gluconeogenesis is critical for maintenance of euglycemia during fasting. Elevated gluconeogenesis during type 2 diabetes (T2D) contributes to chronic hyperglycemia. Pyruvate is a major gluconeogenic substrate and requires import into the mitochondrial matrix for channeling into gluconeogenesis. Here, we demonstrate that the mitochondrial pyruvate carrier (MPC) comprising the Mpc1 and Mpc2 proteins is required for efficient regulation of hepatic gluconeogenesis. Liver-specific deletion of Mpc1 abolished hepatic MPC activity and markedly decreased pyruvate-driven gluconeogenesis and TCA cycle flux. Loss of MPC activity induced adaptive utilization of glutamine and increased urea cycle activity. Diet-induced obesity increased hepatic MPC expression and activity. Constitutive Mpc1 deletion attenuated the development of hyperglycemia induced by a high-fat diet. Acute, virally mediated Mpc1 deletion after diet-induced obesity decreased hyperglycemia and improved glucose tolerance. 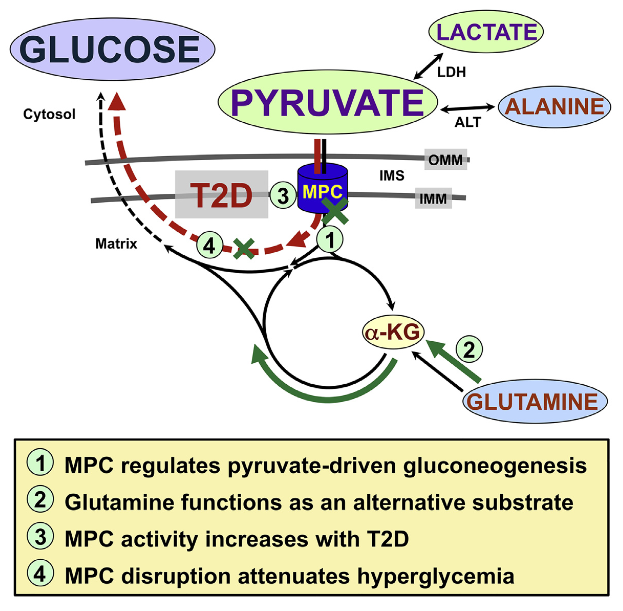 We conclude that the MPC is required for efficient regulation of gluconeogenesis and that the MPC contributes to the elevated gluconeogenesis and hyperglycemia in T2D. Hepatic Mitochondrial Pyruvate Carrier 1 Is Required for Efficient Regulation of Gluconeogenesis and Whole-Body Glucose Homeostasis. Taylor et al 2015.